MARINE VIEW CLOSE This private close was built just a few years ago and is located off Egypt Hill in Cowes, just along from the lighthouse and seafront. 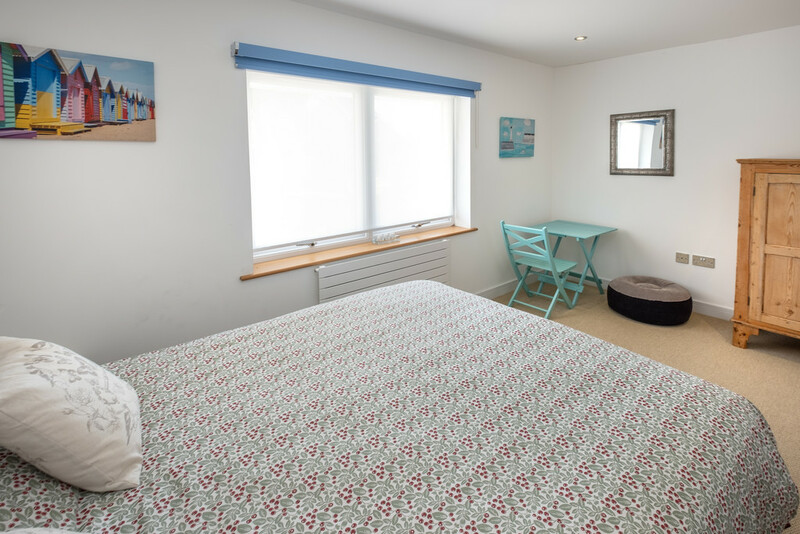 There are just 7 properties in the development, number 5 is detached and has been thoughtfully designed to provide generous rooms with versatile uses and naturally to make the most of it's close proximity to the sea front- with glorious sea views from many of it's windows and balconies. UTILITY ROOM 6' 1" x 5' 0" (1.85m x 1.52m) Frosted double glazed window to the side. Fitted with white 'high gloss' units with a stainless steel sink and drainer and mixer tap. 'Worcester' combination boiler. Washing machine & condenser dryer. Extractor fan and tiled floor. BEDROOM 4 14' 2" x 8' 10" (4.32m x 2.69m) A double room with a double glazed picture window to the front and radiator underneath. Carpet. Door to: En Suite bathroom, as like all the bathrooms and shower rooms, smart and fully tiled to the ceiling. Fitted with a suite of with low level WC, pedestal wash hand basin and panelled bath with chrome shower fittings and a glass shower screen. Mirror with light. Chrome heated towel rail, extractor fan. BEDROOM 5/RECEPTION ROOM 9' 8" x 9' 6" (2.95m x 2.9m) Currently used as a reception/hobby room. Full height double glazed door opening to a large decked terrace. Tall radiator. 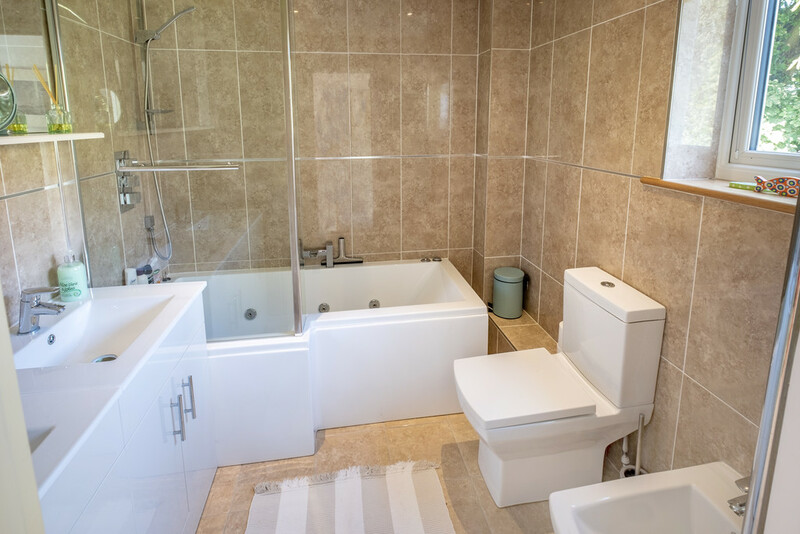 Door to: En Suite Shower Room, fully tiled and fitted with low level WC, pedestal wash hand basin with illuminated mirror and a large walk in shower with chrome shower fittings. Frosted double glazed window to the rear. Chrome heated towel rail and extractor fan. INTEGRAL GARAGE 19' 3" x 12' 8" (5.87m x 3.86m) Steps down to generous size garage, with electric 'up and over' door. Double glazed window to the rear and side. 'Dumb waiter'. Understairs cupboard. 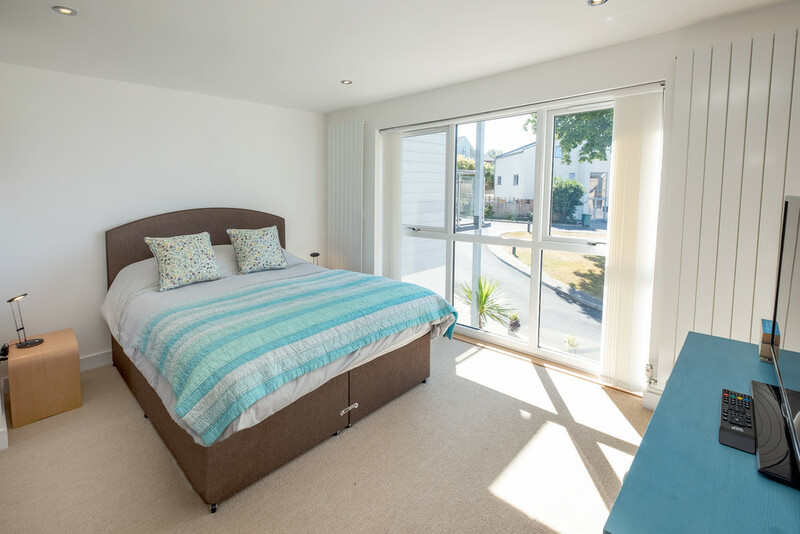 BEDROOM 2 12' 9" x 12' 1" (3.89m x 3.68m) Generous double room with full height double glazed windows to the front and two tall radiators. 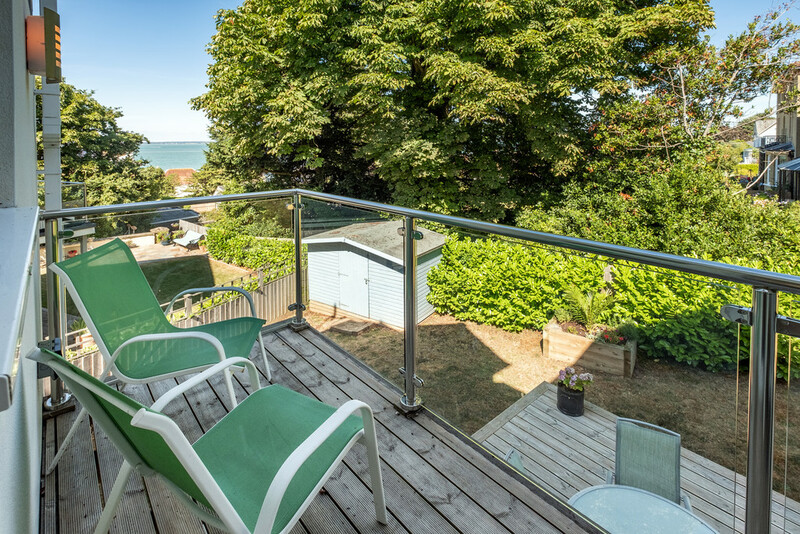 Walkway to a glazed door that leads to private decked balcony with stainless steel handrails, glass panels and lovely views of the sea. 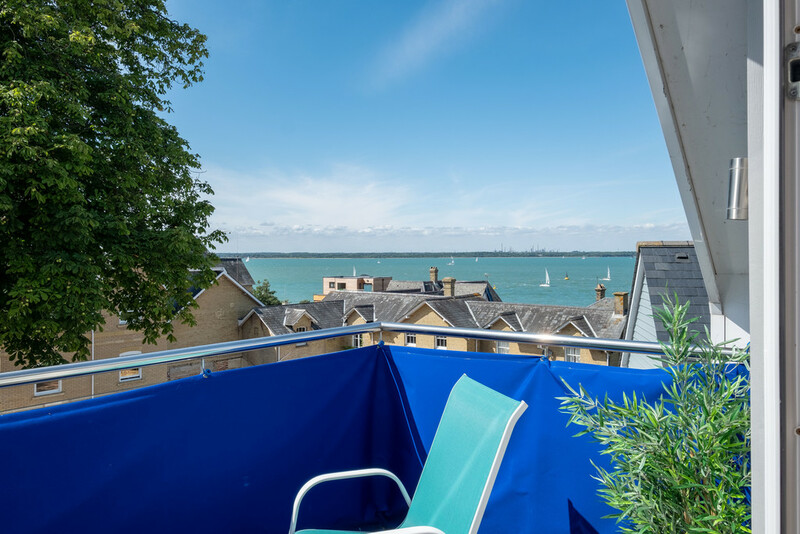 The balcony measures 3.8 metres x 1.4 metres. 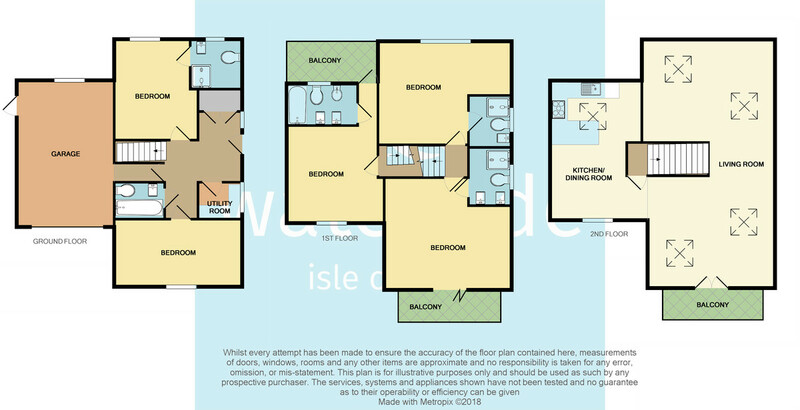 Door to: En Suite Bathroom, fully tiled and fitted with low level WC, bidet, 'His and Hers' basins with vanity units and illuminated mirror, large whirlpool bath with shower over and glass shower screen. Chrome heated towel rail and extractor fan. 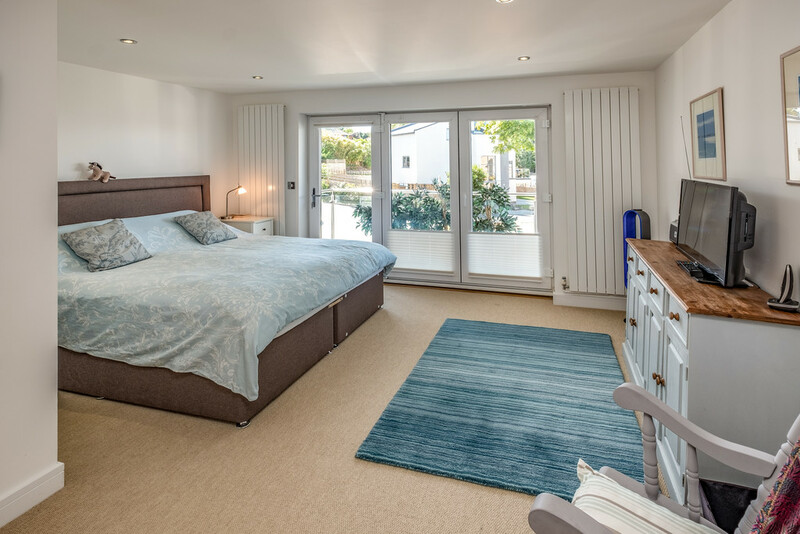 MASTER BEDROOM 15' 5" x 14' 2" (4.7m x 4.32m) Super master bedroom with full height double glazed bi-folding doors which open onto a balcony with stainless steel handrails and glass panels. Tall radiator. 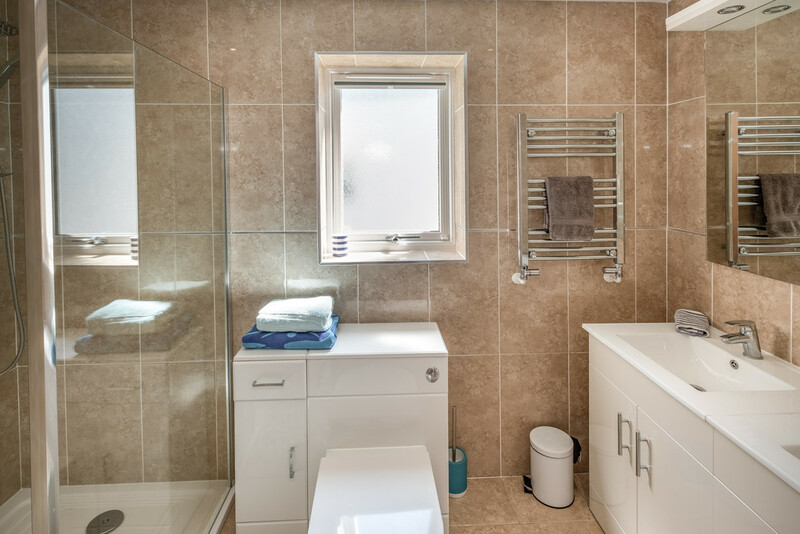 En Suite Shower Room: Fully tiled and fitted with low level WC, 'His and Hers' basins with vanity storage underneath and illuminated mirror, large walk in shower with chrome shower fittings and glass shower screen. Chrome heated towel rail and extractor fan. BEDROOM 3 14' 2" x 9' 6" (4.32m x 2.9m) A double room currently used as a dressing room for the master bedroom. Double glazed window to the rear with sea glimpses with radiator underneath. 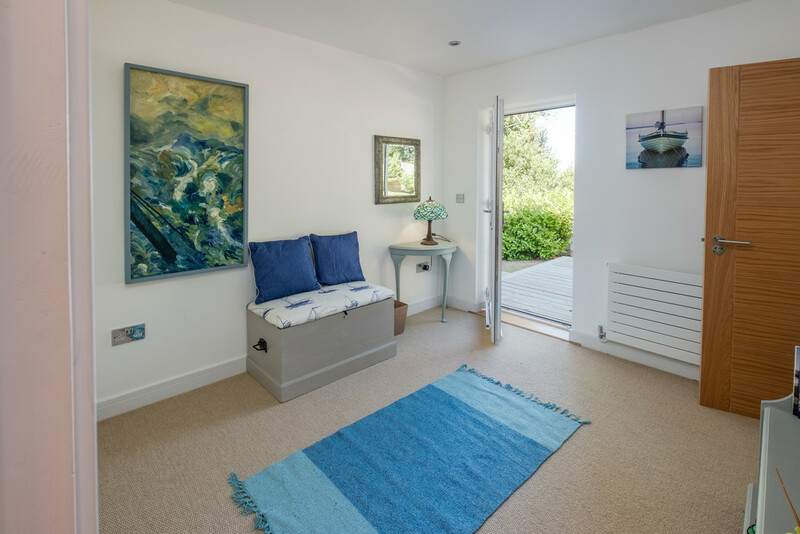 Door to: 'Jack and Jill' style Shower Room: Also accessed from the landing area. Fully tiled and fitted with concealed unit WC, wash basin set into vanity unit with illuminated mirror cabinet, curved shower cubicle with chrome shower fittings. Chrome heated towel rail and extractor fan. Frosted double glazed window to the side. KITCHEN 19' 4" x 12' 11" (5.89m x 3.94m) Fitted with a range of white high gloss units with granite counter top which incorporates a stainless steel basin with mixer tap. 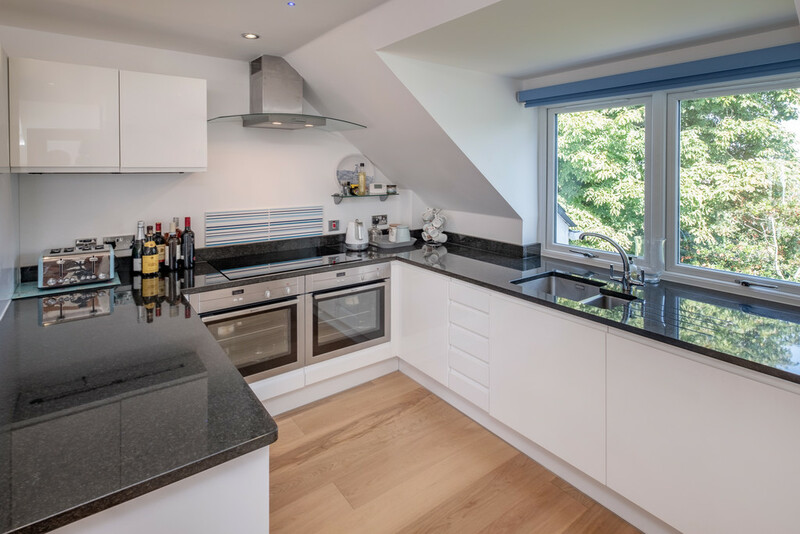 Integral appliances include two 'Neff' fan assisted electric ovens, ceramic hob with steel extractor hood, fridge/freezer and dishwasher. Access to 'dumb waiter'. 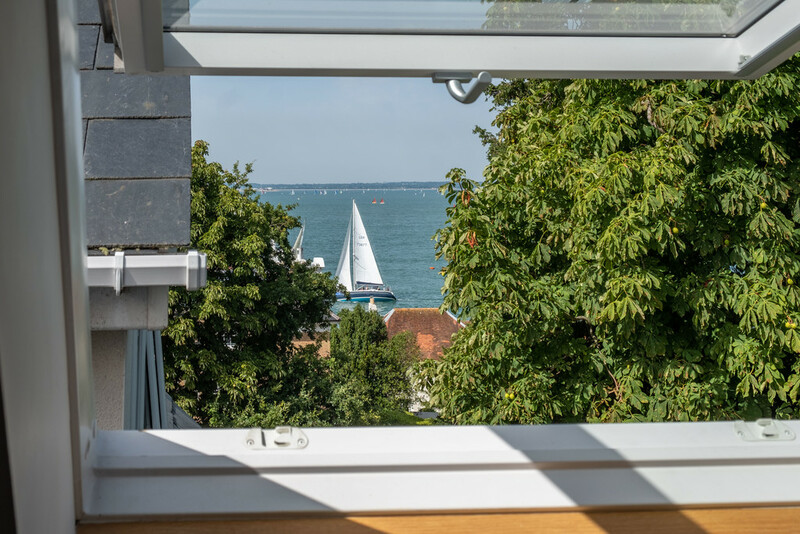 Double glazed window to both the front and rear with sea views across the Solent. 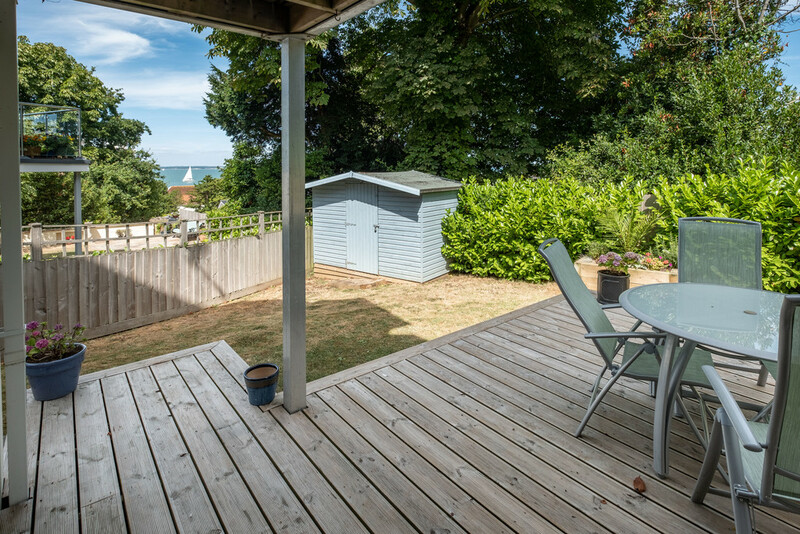 OPEN PLAN SPLIT LEVEL LIVING SPACE Steps up to a superb open living space over two levels with a kitchen and dining area with sea views to three aspects. Steps up to a 32 feet plus fabulous living space with a separate study/ snug area. Wooden flooring throughout. 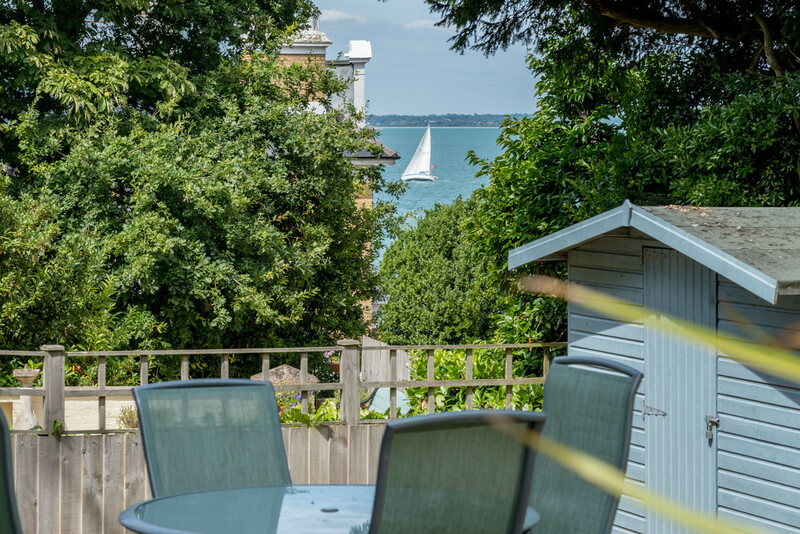 SITTING ROOM 32' 6" x 14' 2" (9.91m x 4.32m) Gloriously spacious and light with 4 'Velux' windows and full height 'French' style double doors and side windows opening out to a balcony that enjoys superb Solent views. 3 contemporary radiators. A log burner provides a cosy focal point. Small storage cupboard. 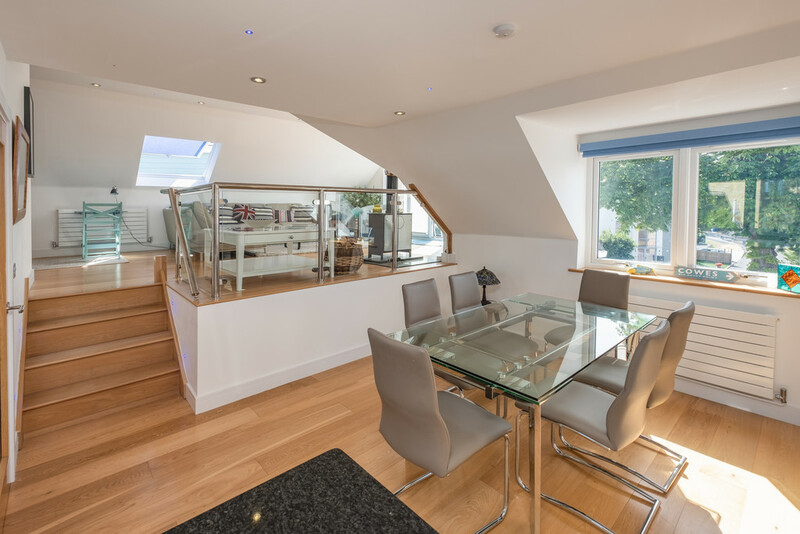 Stainless steel balustrades and glass panels separate the areas. 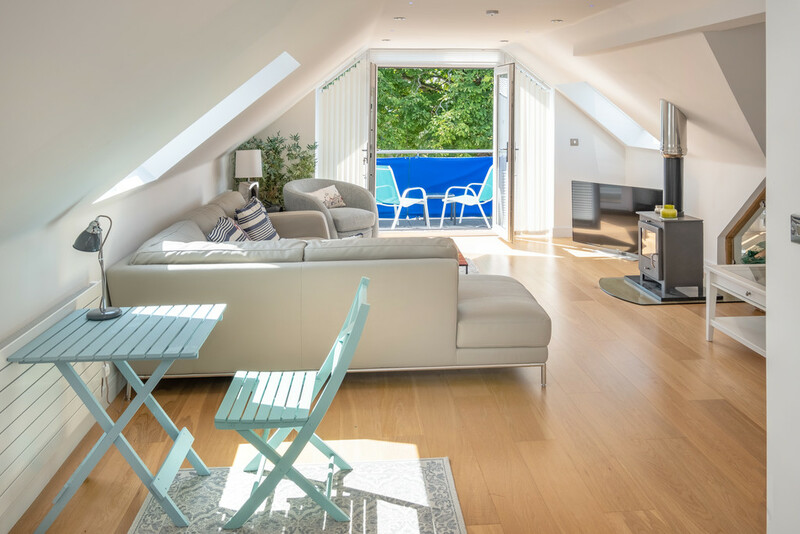 The open plan living space is neatly divided into a sitting area and snug/office. Block paved driveway to the front to accommodate 2 vehicles. Access to the garden via both sides of the property. 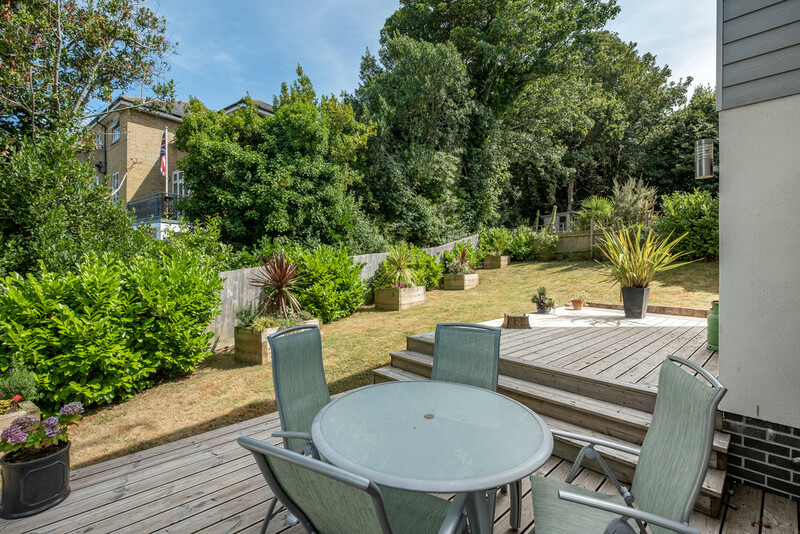 The rear garden provides a lovely entertaining space with generous decked terrace, lawn and several planters built with attractive sleepers. Garden store. 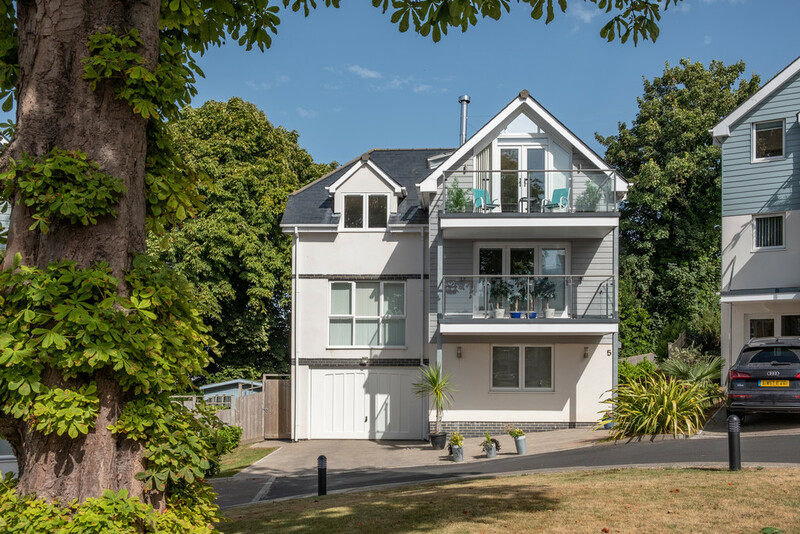 This home benefits from the remainder of a 10 year NHBC guarantee. 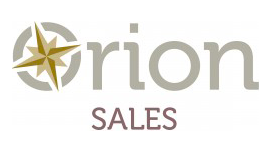 The bathrooms and shower rooms are contemporary in style, fully tiled with chrome fittings and illuminated mirrors or mirror cabinets.. Radiators are also contemporary style. Recessed spotlights throughout, mood lighting in the upstairs living space and long the staircases. All light switches, sockets and TV points are chrome. 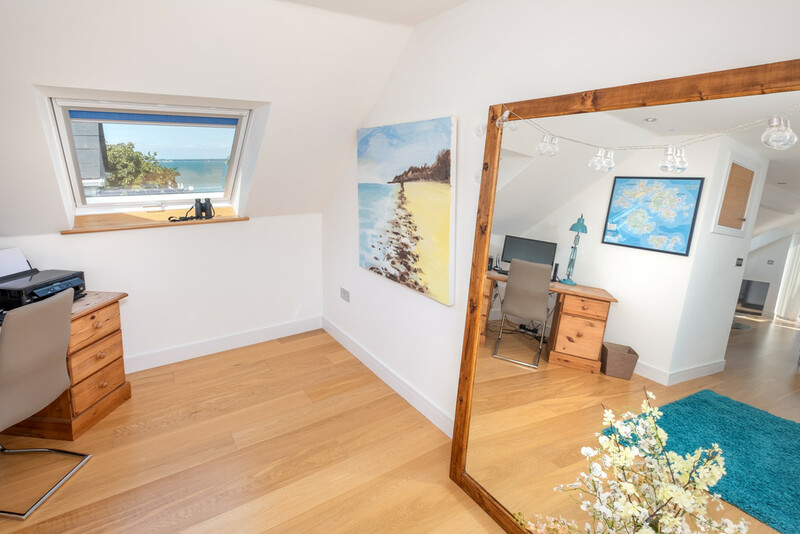 The carpets are neutral and walls are painted in fresh white, internal doors are heavy oak veneer and wooden flooring where specified is engineered oak.